Greetings from the AT! I can’t believe it’s already been three weeks out here. 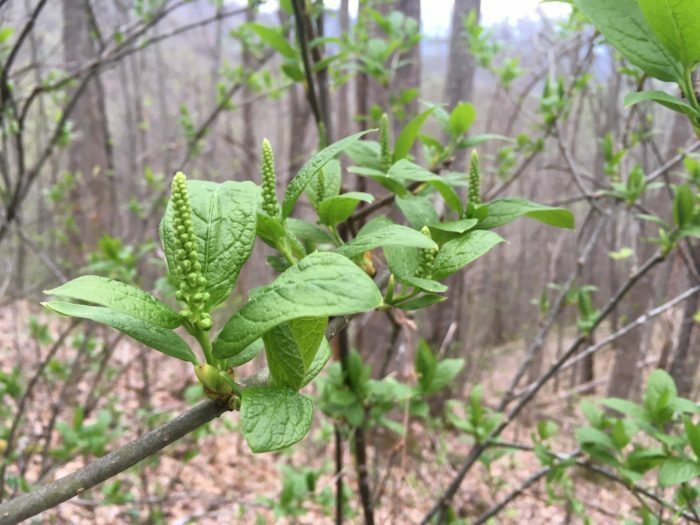 The earth is moving from gray winter to vibrant green spring. More chickadees and wrens are singing now; they wake me up with their lilting songs every morning. There have been thunderstorms, sweltering sunny days, wind gusts, hail, and every weather pattern in between. 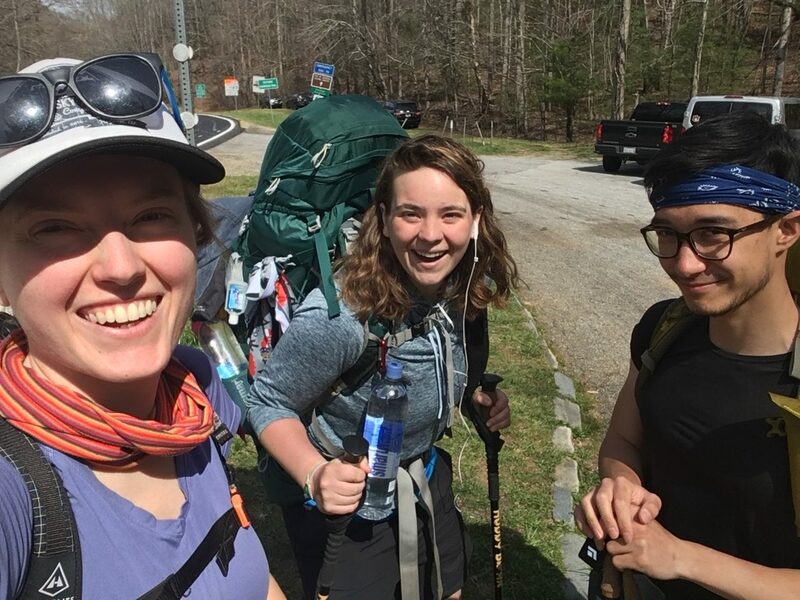 I have already met so many people with interesting stories, exciting personalities, and varying reasons for hiking the Appalachian Trail—yet here we all are together, telling jokes and experiencing the unique majesty of walking for days on end. As I walk, I have been thinking about what to write. What can I say about my trek on the AT that hasn’t been said before? So many folks have beautiful stories about the outdoors and the thoughts that spin around in their heads as they take their steps. Maybe my ideas will get more organized as I go along, but for now it’s a bit of a jumble. One thing does stand out as I write this first on-trail post, however: listening. I have been reminded over and over of the importance of listening to our bodies, listening to each other, and listening to the place. Important “Listen to Your Body” tip: Do not put off getting water, even if filtering is annoying. Here we have Krazy Glue and Willow/CVS/Zahzu (he has a lot of names) procuring water. If you’re a thru-hiker in the early parts of your walk, you’ll hear a lot of mantras repeated to you: hike your own hike, the trail provides, listen to your body. They all have merit, and they all deserve writing. The latter, though, is the one that stands out to me. On my last long-distance hike, I developed a rather severe case of achilles tendinitis. Thinking back to this hike, I realized that many of the issues I dealt with could have been avoided if I’d listened to my body. I wore the same pair of trail runners for far more than 700 miles, and by the time I got to Santiago there was barely any sole between my foot and the ground. I stretched well at the end of the hike, when the pain was out of hand, but not very well at the beginning. And I knocked out big miles right from the start: 15-, 17-, 20-mile days along the relentless Basque coast. Going into my AT hike, I was really nervous about my proneness to injury. Despite dutiful stretching, icing, and rest for the entire fall of 2018, I can still feel the whisper of pain sometimes if I step just right. So I knew I had no choice but to listen to my body, do the stretches and massages that I knew worked for me, and keep my mileage down. Camp on Rocky Mountain. We might have been able to go a little farther, but this was a good distance for us. The storm was rough that night but our little tents did well! That’s exactly what I’ve done. In the first two weeks I aimed for no more than ten miles per day. Even though I’m tired when I get to camp, I do my stretches, massage my achilles, and roll out my arches (PS: a 25-cent bouncy ball is a super compact and lightweight option for this). Though some days I’ve woken up wanting to accomplish larger miles, I’ve reminded myself of the pain I caused by starting too much, too fast. Now, about 150 miles in, I’m ready to do bigger days. My tramily and I just did our longest day yet: 18 miles. And at the end of it, I stretched and massaged. There are lots of ways to listen to your body, beyond being concerned about pain and injury. If you’re hungry, stop and eat what you need, rather than waiting for a milestone or a big view (I am not very good at this). When you know you’ll be resting for a while, take off your shoes and socks and let your feet air out (I’ve become better at this). If you know you need water but don’t want to stop, stop anyway. If you feel gassed in the middle of a climb, just stop for a minute. If you feel great and know you can keep going, great! Try it. But make sure you’ve had enough snacks, breaks, and water. 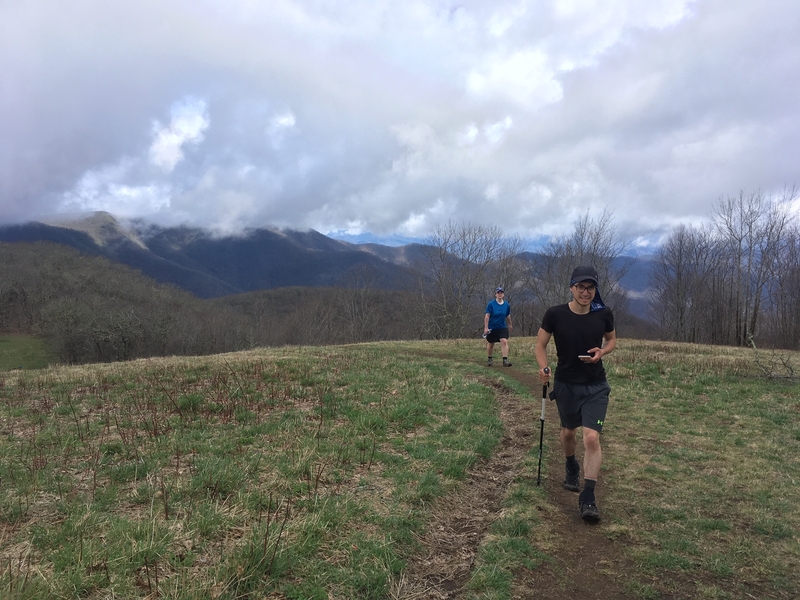 Ascending Siler Bald on a blue blaze. Bring snacks! The view is worth it, but energy is important. It’s bizarrely hard to listen to our bodies. This is true in everyday life as much as it is on the trail. We know we need exercise, healthy food, and rest, but it’s hard to find the motivation to do what we know we need to do. On this hike I’ve been reminded of how easy it is to ignore what we know we need and try to hit goals. That’s not productive, and in the long run listening to your body pays off. Heed this mantra, hikers. You will enjoy the journey so much more. One of the chief joys of the Appalachian Trail is the other hikers. This isn’t always a welcome reality; I’ve heard some folks bemoan the crowded nature of the AT and the lack of solitude. I think this is a misguided complaint. 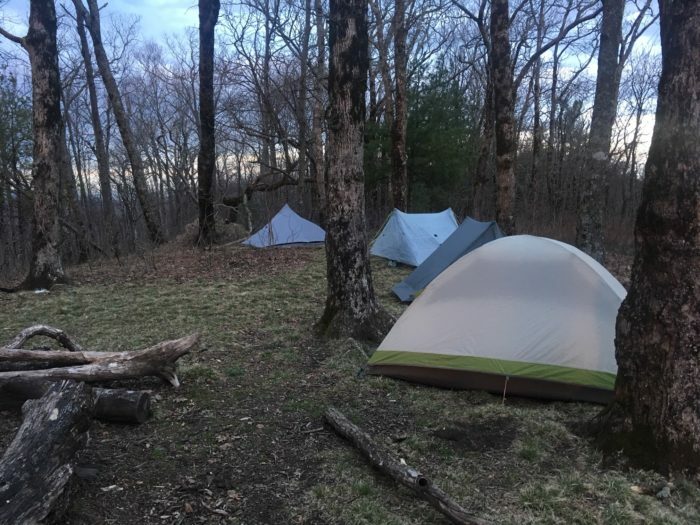 There are definitely merits to alone time in the woods, but that’s not why I decided to hike the AT. My other hikes have shown me how beautiful it can be to open up and have conversations with other folks walking in the same direction. I’ve heard so many stories, made friends I still talk to, and learned so much about myself from conversations with other hikers. My excellent tramily and me, after getting back on trail after 48 hours of being sick. Me (Passport) on the left, then Patches, and Krazy Glue. That being said, sometimes I find it difficult to summon the energy to be social on the trail. After a long day, the introvert inside me just wants to be alone in my cozy little tent. But it is so important to emerge from that space (after necessary rest, of course), because the conversations at the shelters and around the campfire can change perspectives, challenge ideas, and provide meaningful stories. At the very least, there will always be something interesting to remember. It’s not always easy, but the humility and patience required to genuinely listen to each other are necessary attributes for a successful thru-hiker. I’m so grateful for my little tramily, and I am looking forward to the other folks I will meet and converse with on this trail. PS: Shout out to Patches and Krazy Glue for listening to my rambling stories and hangry interludes. Y’all are the real champions here. Before I started my hike, I downloaded two apps: the Audubon bird guide and PictureThis, an app designed to help the user identify plants. I realized that I didn’t know what most species of birds looked or sounded like, and I didn’t know how to identify any plants besides poison ivy and poison oak. This bothers me. Despite being an outdoorist and appreciating nature, I know nothing about it. All the time I’ve spent on the earth, and I know next to nothing about the species that inhabit the space I live in. I also downloaded the audiobook version of Braiding Sweetgrass by Robin Wall Kimmerer before I started the AT. Kimmerer is a member of the Citizen Potawatomi Nation as well as a botanist, and her book investigates indigenous and scientific knowledge about the environment, and how the two can intertwine. Early in the book, she muses how Native people in North America viewed (and continue to view) humans and nature as one and the same, engaged in a harmonious gift economy. Settlers, in contrast, view land as a commodity, not something that gives and expects but something that can be exploited for the benefit of the humans at the top of the food chain. As I walk, it has become clear how misguided this second view is. What am I, compared to this forest? What am I, compared to these, the oldest mountains in the world? And yet at the same time, I am also part of these mountains, and I want to learn more. I want to hear them. So, awkward, I don’t actually know what this plant is. But it is a joy to watch spring emerge. Coming down a hill a few days ago, it was suddenly spring. So much oxygen! It’s delightful. I can’t identify every birdsong yet, but I’m getting there. Now I hear the eerie four-note song high in the trees and say, “That’s a Carolina chickadee!” I hear the cascade of trills in a branch and think, “Hello, little wren.” I’m not great at the plant identification, but I do see white pines and rhododendrons and tulip poplars. I can’t mend the scars my ancestors caused; I can’t make us all close to the trees. But I can listen. I can learn. It’s not always easy to be present and listen. Sometimes I feel myself drifting away to another place, but then something snaps me back. A bird. A flower. A cool salamander on the trail. The beginning of green leaves and the miraculous emergence of spring from the brown hillsides. I am so grateful for all of my teachers: my fellow hikers, the mountains, the species around me, and the trail. I’m happy I listened to my body and kept my mileage down at the beginning, because now I feel full of energy and ready to go on. 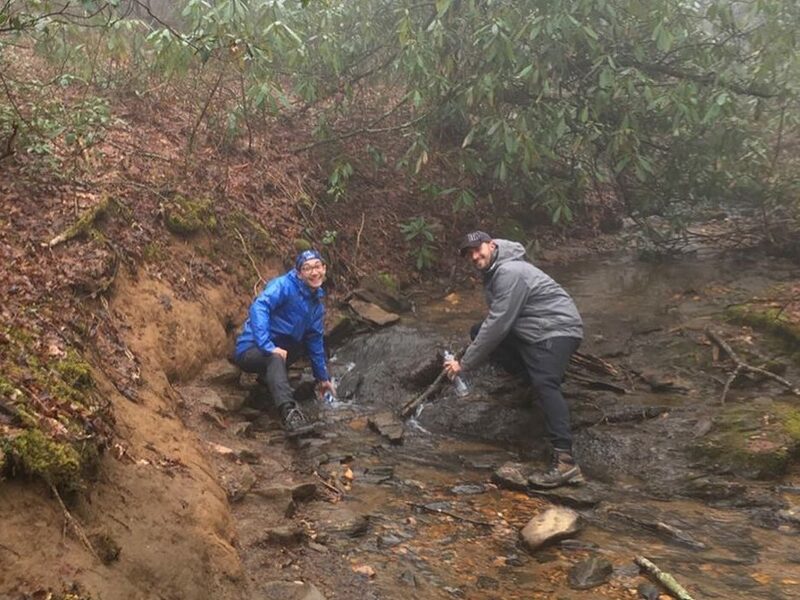 Here’s to much more musing, learning, and listening on the Appalachian Trail.